If your dishwasher door seal gasket is NOT damaged, you may have loose screws on the door. The screws on the inner door may be loose and thus causing leakage. Use the proper screwdriver and tighten the screws hand tight. If you find that the screws are tight but one or two are missing, you can order new dishwasher screws and parts online. If your dishwasher gasket is in good shape, no missing or loose screws, then the door itself may have an issue. Check to be sure the dishwasher door closes properly, makes a contact that seals, and latches when you shut it. If the dishwasher door does not latch, then either the door latch assembly, door frame assembly, or the door itself may be faulty, bent, or damaged. Troubleshoot the problem and find out what part needs to be replaced, tightened, realigned, or cleaned. You may also have a leak from another area of the dishwasher and it MAY SEEM like it is coming from the door. Other parts inside your dishwasher may leak water and the water will come out on the floor in front of the dishwasher. If this is the case, then another part besides the door gasket is leaking. See below for the other parts that may make it look like the dishwasher is leaking water from the door. What else can cause a dishwasher to leak besides the door gasket? 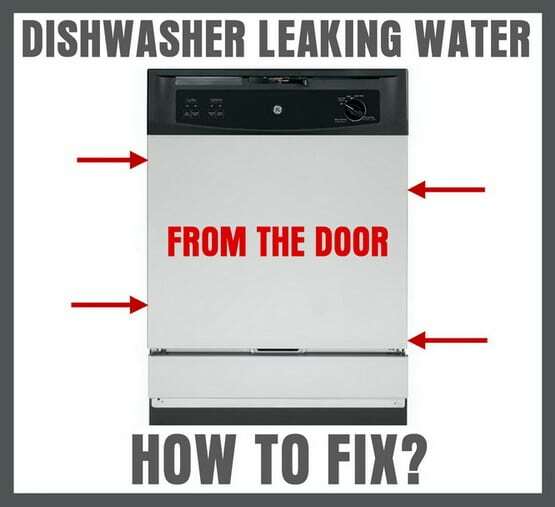 After checking the dishwasher door seal gasket, check for a leaking water inlet valve, faulty water pump, bad pump seal, broken float switch, stuck float, damaged water line, or loose water line. These parts can leak and make it seem like the dishwasher is leaking from the door. 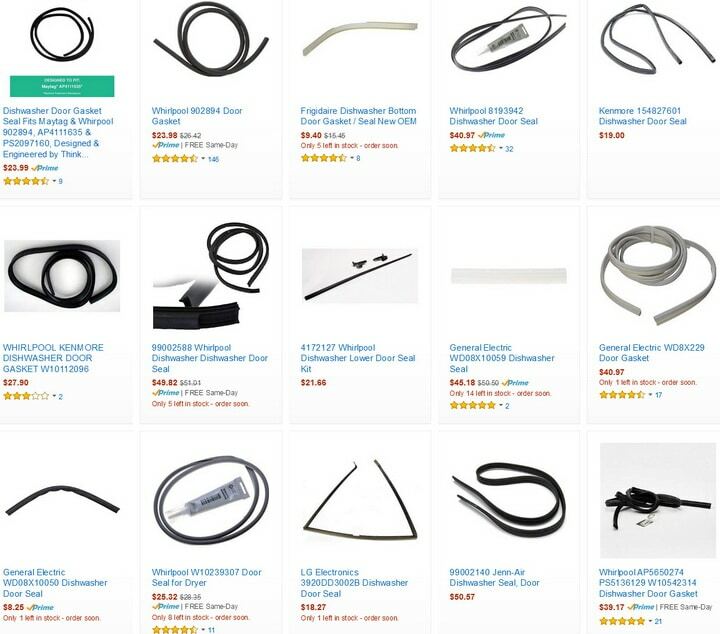 Check all these parts to be sure they are not damaged, loose, and leaking. Here is a page to show more detail on How to fix a leaking dishwasher. BRAND NEW DISHWASHER LEAKING? : If your dishwasher is brand new and leaking water from the door, this is because the door seal is not properly seated. This is normal. 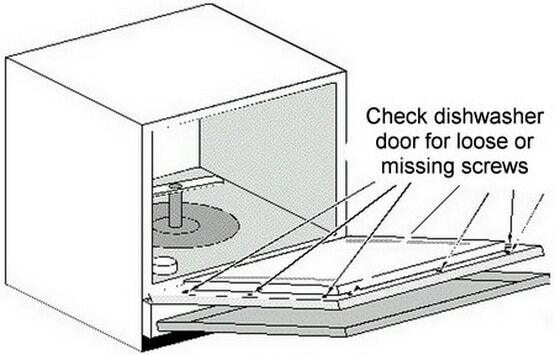 Your new dishwasher will have to go through a few wash cycles before the door seal is perfectly seated. The leaking will stop after a few uses. Note: Some model dishwashers will have a main dishwasher door seal gasket IN ADDITION TO other smaller gaskets in the corners of the door. 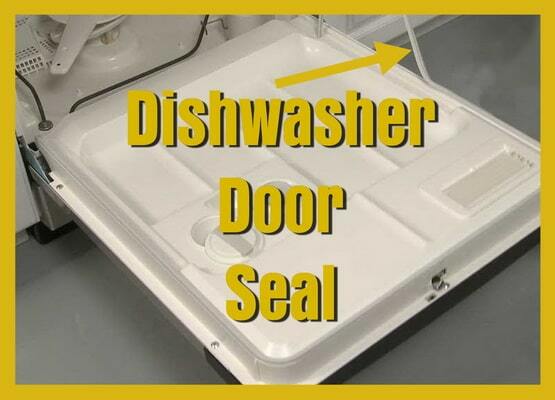 It will depend on the model of your dishwasher if it has these smaller seals or gaskets. If your dishwasher has these smaller gaskets, they will be located in the lower corners of the dishwasher tub. If your dishwasher has the corner tub gaskets, make sure they are not missing or damaged. If so replace them with the correct OEM part. The dishwasher door leaking repair methods above will work on the following dishwasher makes and models: Samsung, LG, Kenmore, GE, General Electric, Electrolux, Amana, KitchenAid, Tappan, Maytag, Hotpoint, Whirlpool, Bosch, Siemens, Frigidaire, Estate, and Sears. Previous post: How To Get One End Of A Stuck Drawstring Pulled Back Out Of A Hoodie?